Stupid mustache fires… They hurt like heel,and they’re really hard to put out. you could repetedly slap your face. that would put it out. So I guess he should not blink that fast as well – at least not with brows that long. He just needs a tad more practice, here. 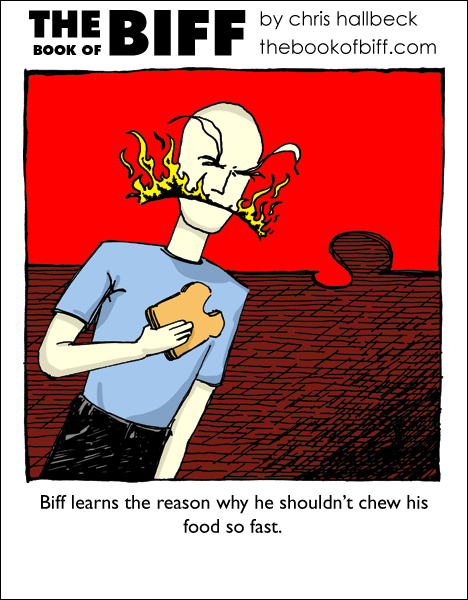 If he slows down JUST A LITTLE BIT, then he could save a lot of time by COOKING THE FOOD as he chews, via the resulting friction. and 2: he’d break his face. But, didn’t he learn that he shouldn’t use hammers to put out a fire? Or, maybe he learned that TWO shouldn’t be used, and he’ll try one? Wait, is that a wall in the background, because the bottom of it is shaped very oddly and would defy physics if it really was a wall that went all the way to the floor. He’s standing on a giant puzzle. Malachite Dragon: Breaking his face wouldn’t stop him from using the hammers. Well, he might think the flaming hammers didn’t work on GREASE FIRES, maybe they’ll work on FRICTION FIRES. Now that is some real Mexican fire sauce! I see he still lives on the side of a hill.